Our nasturtiums have been grown in large pots and an old wheelbarrow this year and they are overflowing their containers. A profusion of greenery speckled with some colourful flowers, they look very healthy, even in our cold winter months. For this reason I have called this painting tenacity as they are truly a tenacious plant. 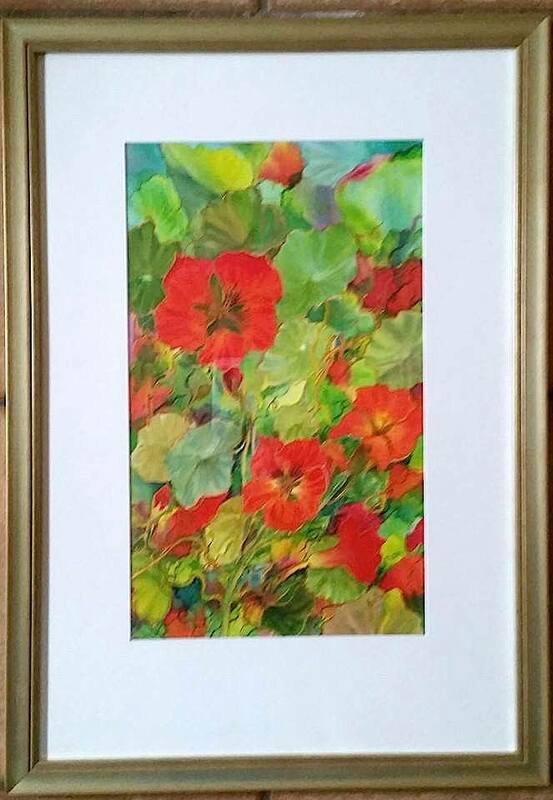 This entry was posted in art, flowers, painting, Silk painting and tagged colour, floral, floral art, flowers, framed silk painting, garden, garden colour, gutta resist, nasturtium, pot plant, silk painting, tenacity, winter garden. lovely, as usual! But on thurs.pm, if you are in Lonnie, a group of us are having a digital show at the Manhattan Cocktail Bar. Also, there is a Regional National Arts Conf. in W.A. october, to which The Holographic Lounge Room Experience (facebook) people are taking work from tas. artists. Check it out on the site I am one of the artists, as are quite a few others that you know. There would be further info on the Reg. site as well. You just submit four digital images of your best work and they do the rest, as far as I can work out.